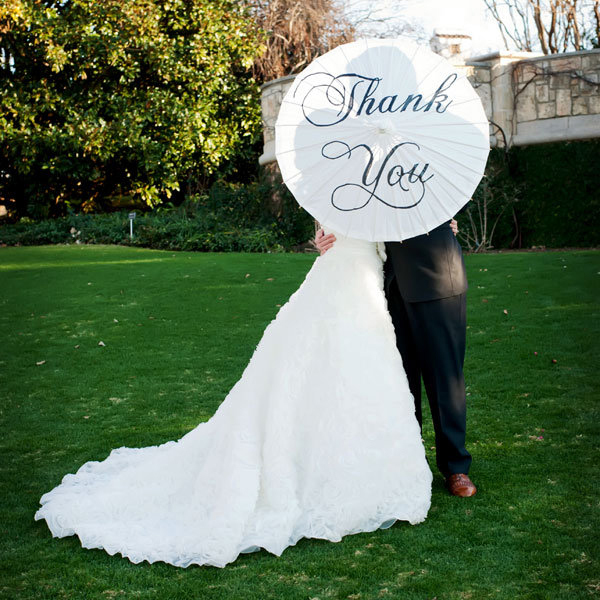 One of your first (and more important) post-wedding tasks is to send out your thank-you cards. Many couples include a wedding photo with each cards, either through a custom design or by placing a photo inside the card. But how do you choose the perfect photo for your cards? Make your job easier by planning ahead and taking a picture specifically for your cards. Here, 20 creative ideas we love. Spell it out on a paper parasol. A simple post-it note is all you need. Get creative with Scrabble tiles. Hide a secret message inside a book. Trace the letters in a series of sparkler photos. Hosting a destination wedding? Say "thanks" in the native language of that region. A simple chalkboard is all you need. Speech bubble chalkboards are a fun way to say how you feel. A sweet handwritten sign in a heart is the perfect fit. The sign is the finishing touch to this sweet and romantic photo. Show off your shoes — and your gratitude. Opt for whimsical signs that reflect your color palette. Vinyl on wood will withstand the elements of the day. Create an easy banner with kraft paper and adhesive letters. A classic photo is even sweeter with a thank-you banner. Choose a color that'll pop against your wedding setting. Or choose colors that'll enhance your natural setting. Hand out letters to the members of your bridal party. And don't worry about getting it perfect!